As artists I think it's important to support and help promote events that fund the arts. Howard County's Celebration of the Arts is one of the events I choose to support. It is fast approaching, to be held next Saturday, March 24th from 6 - 10pm. I have some of my functional glass pieces in the Silent Auction which contains work from artists who live, work, or exhibit in Howard County. Also at this event are live performances, a Rising Star competition, and a presentation of the Howie Awards which honors individuals and businesses for making significant contributions to the arts in Howard County. For those who would like to see the Silent Auction artwork without attending the event, you can do that on Saturday from 1 - 4 pm in the Rouse Company Foundation Gallery in the Peter and Elizabeth Horwitz Visual and Performing Arts Center at Howard Community College. At right is a sample of Dragonfly Sushi plates and wasabi bowls that I create in fused glass. A set of 2 plates and bowls are included in the auction. 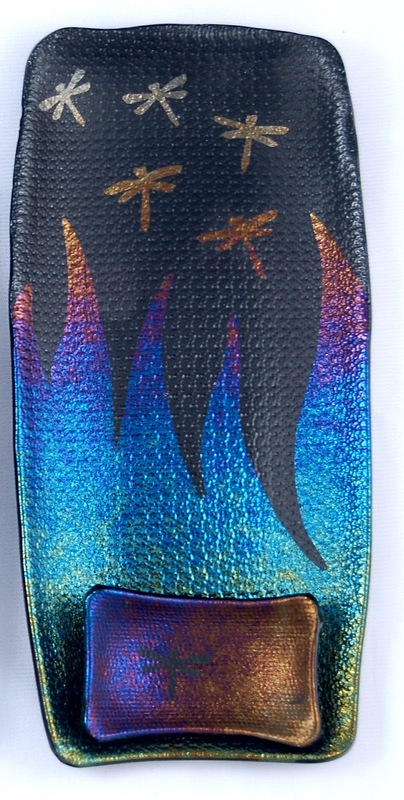 Since these are individually made no two are exactly alike; the colors and dragonfly design vary from piece to piece. Art after Retirement - Incredible! I've been retired from engineering for one week and here are the results. I'm refocusing on art and making it my priority. My results tell me I'm headed in the right direction. What do you think? 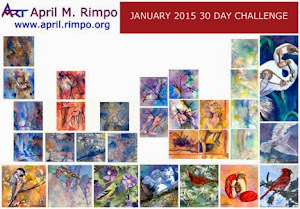 If you are interested in a print on canvas or a different size print on watercolor paper, contact April. Prints can be made up to three times the size of the original painting, which was 21" X 27". 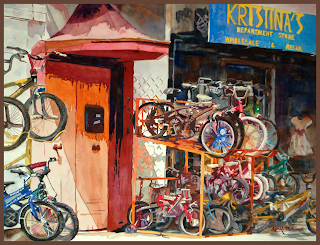 I was drawn to this scene as soon as I saw it; all the bikes, the beautiful doorway, and the bright sign had me in a second. We drove past it quite a few times and each time I tried to get a photograph without much success. I loved the charm of this department store in Marigot, St. Martin. This is certainly not what we think of as a department store in the U.S. I love color and this store had so much to offer. 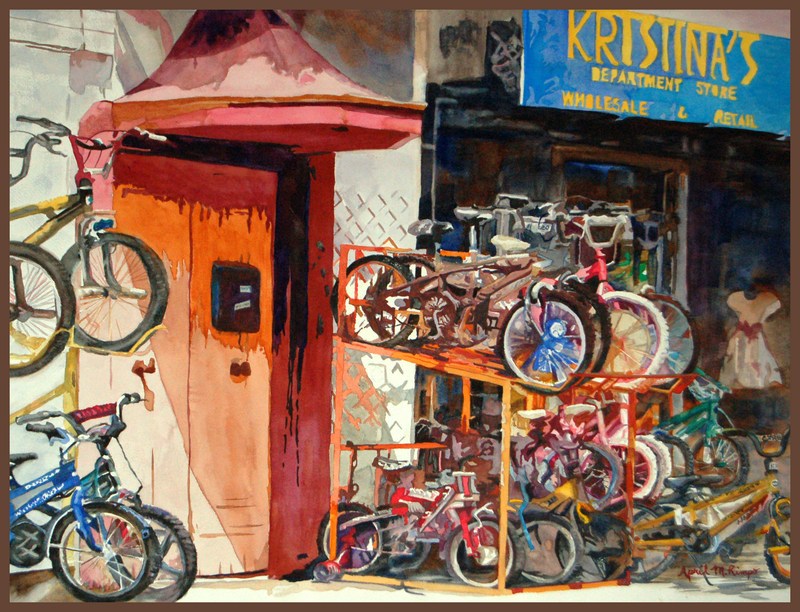 I had to rearrange colors and bikes to make a better design but this just enhanced the thrill I felt when I first saw it. I hope you love my painting as much as I loved the scene. Prints are available on watercolor paper and on gallery wrapped canvas; check my store for other prints.